The DPS Site Dialer, featuring Alarm ShoutTM technology, calls up to 8 contacts with your custom voice alerts when important alarm conditions occur. The DPS Site Dialer is the newest accessory to the popular line of NetGuardian RTUs. Receiving and acknowledging alarm notifications from the field is easy with custom voice alerts. The Site Dialer is supported by all your NetGuardian 832A and 864A remotes. When an alarm is triggered, the DPS Site Dialer calls up to 8 phone numbers in your call lists with the site name, alarm status, timestamp, and more. You'll use the custom voice wizard in MyDPS to create your text-to speech alarm notifications, or upload your own .WAV files. Protocols: SNMPv1, TELNET, HTTP, SMTP, ICMP. Interfaces 1 DB9 craft port. 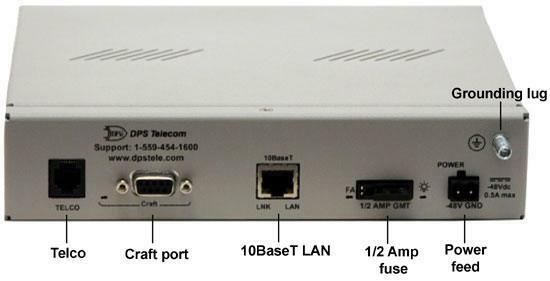 1 RJ45 10BaseT Ethernet port. Voice Alerts: Via text-to-speech and/or user-created .WAV files. Fuse: Resettable Fuse (Internal) or 1/4 amp GMT. Power Input: -48 VDC (-40 to -70 VDC). Mounting: Wall or 19" rack. Visual Interfaces: 1 Firmware-Controlled LED. 2 LAN Connector Hardware LEDs.